First priority for many individuals with cervical spinal cord injury (SCI) is to regain arm and hand function and thus more independence, mobility, and quality of life. This is a realistic goal in at least 70 % of patients with tetraplegia. However, a specialized treatment is only provided to few of possible candidates (less than 10 %) or not at all in many countries. Main goals include restoration of elbow and wrist extension and hand grip against gravity which can be achieved by muscle or nerve transfer, joint stabilizations, and procedures reducing spasticity. One-stage combined procedures have proven considerable advantages over traditional multistage approaches. Immediate activation of transferred muscles reduces the risk of adhesions, facilitates relearning, avoids adverse effects of immobilization, and enhances functional recovery regarding strength, range of motion, and patient satisfaction. Transfer of axillary, musculocutaneous, and radial nerve fascicles from above the SCI is effective and promising options to simplify aftertreatment and enhance motor outcome and sensory protection, especially in groups with limited resources. Functional recovery is yet less reliable and may take at least 6–9 months – ideally, nerve and muscle transfer should be combined to optimize results. 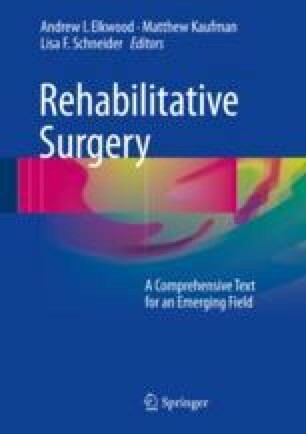 Improved multidisciplinary cooperation of physiatrists, hand surgeons, and therapists should give more tetraplegic individuals the chance to profit from upper extremity surgery and get the chance to “take their life into their own hands” again.